← Change the World ~ One Grocery Cart at a Time? When our boys were around ages eight and ten, their Papa Sims came to our house and said, “Boys, I have a business proposal for you. I am going to give each of you $50.00, but it’s not just to spend, it’s to invest.” He now had their full attention. Free money. A LOT of free money. He went on to tell them this was a challenge for them to take the money and see how they could turn it into more money. He said they would need to figure out a business plan on how to do that, and as long as they worked hard, they would not have to pay the money back. Of course, they took the challenge. If you can imagine two hyper little boys with $100 between them, they had all kinds of ideas. But it wasn’t so much the business plan as it was the goal in their heads. Work hard, make papa proud, buy the Martin guitar for Madison and the set of drums for Malachi. Right around this same time, one of our friend’s from our small group had been to Missouri and came back with a simple little bow and arrow set made from pvc and a few other items. The boys thought this was awesome and that they could sell them. We took them to the hardware store so that they could find all of their materials and estimate their production costs. 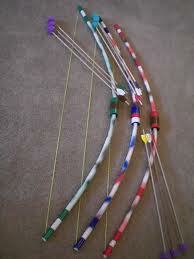 In the next few days, our living room turned into a bow and arrow factory, and my husband and I were working for them. They started setting up at craft shows, in front of Wal-Mart, not to mention coaxing their friends into buying their items. During this time there was a lady in our town that experienced a severe accident. They decided to donate $1.00 of each sale to a fund for her. When one of our friends saw the bow and arrows, she had the boys build a little display box and took them to her son’s school and sold them there. There was a write-up in the local paper. (free advertising) In the end, they were able to donate money to someone in need, PLUS, learn about costs, comparison shopping, manufacturing, marketing, and sales. I’m not sure who was more proud the day Madison went to Rawson Music Store in Oklahoma City and picked up his Martin Guitar from lay away. Then we drove to downtown Oklahoma City where Malachi had picked out his drum set. We were all beaming. Our house was forever LOUD, after that! Madison still has his Martin guitar. Malachi is probably on his 3rd drum set. But they still play. They are musicians; they are entrepreneurs. Their instruments mean so much to them because they earned them. They didn’t just say, “Mom, I want this”, or “Dad, get me that” and expect it to appear. Their papa gave them the initial start-up money because he wanted to teach them a lesson, good or bad. They turned that $100 into around $1000 or more. That is an experience that they will never forget. If you want something bad enough, you can figure out a way to get there, with hard work and sometimes changing up your game plan a bit. I wish I could end this by offering each of you $50.00 to “invest”. But instead, I will say challenge yourself. Challenge a young person in your life with something similar. If you can give them the tools to get started, who knows what they might do with them? Smart man, that Papa Sims……thanks for investing in our greatest investment, our boys. This entry was posted in Musicians, Uncategorized and tagged Business plan, Drums, enterprenuers, invest, Invest in the Children, Martin Guitar, No silver spoon. Bookmark the permalink. Entrepeneurs…what a legacy! Sounds like that was “meant to be” considering the friend who appeared with the initial idea….timing! Who couldn’t LOVE a story like this? I’m inspired by just reading your post; it was great. And that Papa Sims – gotta love him! So Darla, does this mean you are going to start making bow & arrows now? 😉 Papa continues to teach us about investing! And eyes are always open for a new idea!